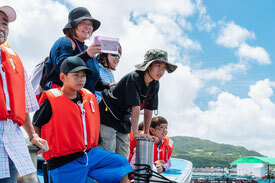 Observe the living things bred at the Okinawa Churaumi Aquarium Research Center! 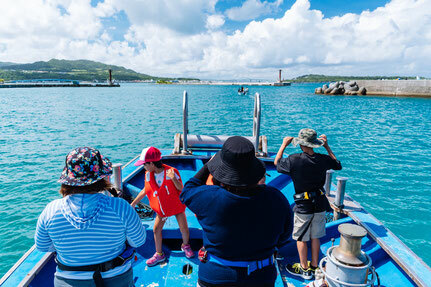 Observe breeding and enjoy a unique experience with staff guidance on manta rays, sharks, and other rays in the fish-pen in marine waters, the research center of the Okinawa Churaumi Aquarium. View nature from a boat floating on a beautiful sea. This is a lifetime experience with the unique creatures of Yanbaru. Discover the powerful action of manta rays! Get close-up photography of manta rays! 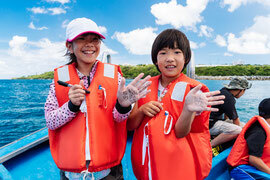 Enjoy the nature of Okinawa on the ship! *The tour may be subject to change due to weather conditions on the day or manta rays's condition. Thank you for your understanding. *Please check-in 15 minutes before departure. 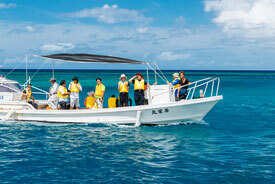 *The journey on the boat lasts about 50 to 60 minutes. Capacity: Up to 10 people. *Preregistration is required. Participants: 5 years old and older. *From 5 years old to Elementary school students require an accompanying parent. Booking: Online at the OSC website　*Please apply by 17:00 on the day before joining. - Please check-in 15minutes before depature on the day. *When searching "Mantayasame" on the Google map, the route to the Yamakawa port is displayed. - There is no toilet in "Yamakawa port". Therefore, please use the toilet before you come to port. - In case of cancellation of tour, we will contact you as soon as possible. - Depending on sea conditions, the boat may sway so please do not wear heels or shoes with thick soles such as platform shoes. - The shipboard is slippery. So you better wear slippery shoes. - The tour takes about 50 to 60 minutes. If you easily get seasick, we recommend you take motion sickness medicine. - The tour may be subject to change due to weather conditions on the day or manta rays's condition. Thank you for your understanding. - In case of cancellation, you can participate in another day tour. Check availability, expiration date is one year. 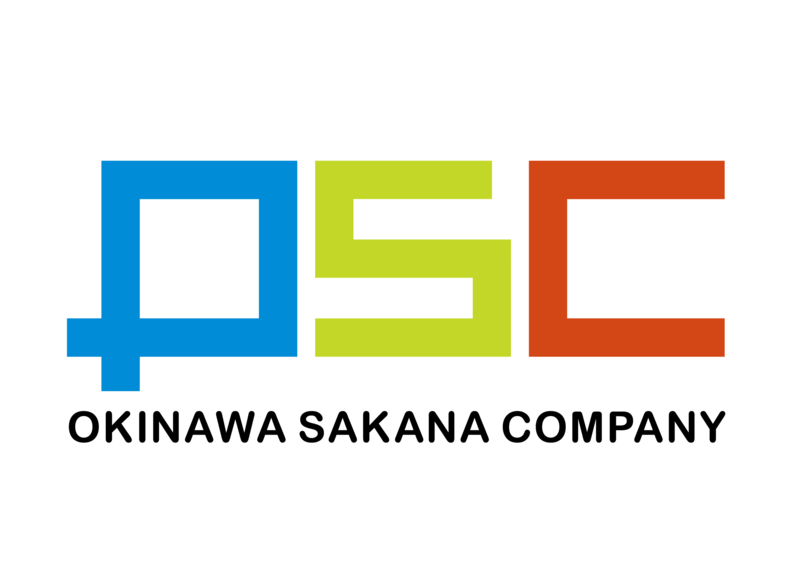 - Please contact OSC Co., Ltd., if you have any questions about the tour. *Please select the participation date from the below. - Guidance on the nature in Okinawa and Yanbaru, the role and mechanism of the fish pen, and other creatures. 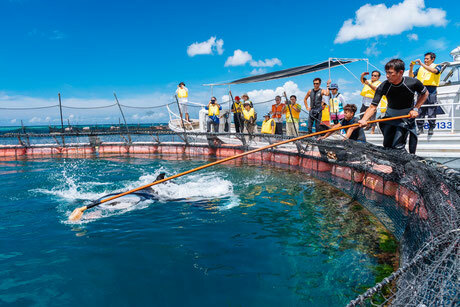 - Observe the living things in the fish pen from the boat. - Feeding of sharks, rays, and other fish. 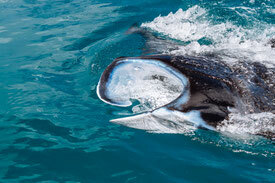 - Observing the feeding of manta rays (Photography OK). - Commemorative photo of the fantastic sea and Ie Island. 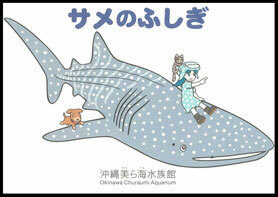 - Gift of booklet "Wonders of Sharks" issued by the Okinawa Churaumi Aquarium. Gift of booklet "Wonders of Sharks"! Copyright （c） 2017 Okinawa Sakana Company. All right reserved.